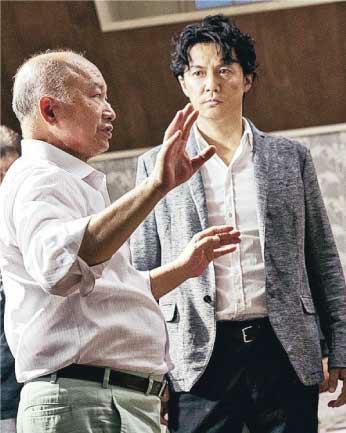 The Media Asia invested John Woo (Ng Yu Sum) new film MANHUNT (JUI BO) starred Zhang Hanyu, Masaharu Fukuyama, Ha Ji-Won and Stephy Qi Wei and Yasuaki Kurata, Jun Kunimura, Hiroyuki Ikeuchi, Nanami Sakuraba and TAO. Since June the production has been shooting in Japan. Currently it is in production in Okayama. Although yesterday an earthquake took place there, the studio had special anti earthquake design. The entire team was fine. Earlier Ng Yu Sum spoke to the Japanese media and was asked about his impression of Masaharu Fukuyama. Ng Yu Sum had nothing but praise. "I wholeheartedly appreciate his professionalism. He is very charming and at the same time very friendly. He is very friendly and knows how to interact with everyone on the team. He also really knows how to respect others. In addition he also has an international image. He is an outstanding actor, his performance is rather exciting." MANHUNT's production cost reached US$ 50 million. The director of course has pressure. Ultimately China and Japan have cultural differences; in addition since the team worked together in multiple languages, they naturally would need even more attention to handle the work. Ng Yu Sum felt fortunate that no matter how great the difficulty was, the morale of the team was not affected. "The entire team is very tough. This production is very complicated because the numerous stunts are very difficult. However I rather admire the Japanese team. They communicate very harmoniously with the Chinese team. They open my eyes." He also said that although it was his first film in Japan, he rather enjoyed it. "I have really liked Japanese films since I was little, I learned a lot of production technique from Japanese films. Now it is like a dream come true." Director Ng even said that he has worked in different countries. Whether in the U.S. or Europe, he has never worked with a team so successfully. In addition the Japanese government has been rather supportive of this production, which enabled them to successfully shoot on location. For that he was very grateful.